Isn’t it bizarre that a 40in set like the Samsung UE40MU6400U seems fairly small by modern TV standards? Not long ago this was the size you went for when you wanted to turn your lounge into a home cinema, and the size that manufacturers launched their flagship models in. But that’s no longer the case. We’ve grown accustomed to the larger models and now if you want the best a manufacturer has to offer in terms of specs and features, you need to go for at least a 49in model, if not a 55incher. Take Samsung for example: its OLED rivalling QLED range only goes as small as 49in. Even the more advanced models in the less premium MU range are reserved for larger screen sizes. If you want a 40in model, the most advanced options are in the 6000-series, as this, the UE40MU6400 is. On the one hand that’s a shame, because you have to make do without premium features such as a 10-bit panel, but on the other hand the price is very affordable. And, given that price, the performance is pretty darn impressive. One added benefit of the UE40MU6400 having a fairly streamlined feature set is that the calibration options are equally streamlined. Combined with some generally sensible out-of-the-box settings, this makes it simple to get the TV performing at its best. As usual, we’d recommend that you turn off the picture-hindering options in the ‘Eco Solution’ mode, then tweak the Standard mode slightly by taking a few points off Contrast, adding a few to Brightness, and switching the Auto Motion Plus feature off. If you generally like a little bit of motion processing, it’s probably worth experimenting with the Custom mode, tweaking Judder Reduction to your liking, but for us the TV’s motion is best without the processing. That’s pretty much all there is to it, although do bear in mind that you’ll have to tweak the settings a second time when you feed the TV an HDR signal, as doing so produces its own set of defaults. In this case it’s actually worth also adding a few points to Backlight, but otherwise the calibration advice remains the same. Having made those few, simple tweaks, you’re now ready to get watching, and in all likelihood you’re going to make a beeline for some 4K HDR content, either via the built-in Netflix or Amazon apps or a 4K disc-player. While it’s fair to say that the impact of 4K is more keenly felt at larger screen sizes, there’s no denying the improvements to sharpness and detail seen even on a 40in display. We play Deadpool on a 4K disc, and the MU6400 produces a superbly crisp and well-defined picture, with all of the definition necessary to give texture to fabrics and reveal freckles and pores on any characters who aren't wearing masks. The TV lacks the 10-bit panel and peak brightness necessary to achieve Ultra HD Premium certification, and it’s fair to say that it struggles to muster the punch necessary to make the most of HDR content, but given the price of the set and the fact that HDR is still a way off ubiquity, we’re prepared to accept that – especially because general contrast and colours are very impressive. The depth of the blacks means that the whites, while limited compared with more premium TVs, look fairly pure and bright, and there are few TVs at any price that can lay claim to a more natural colour palette. Skin tones are natural and nuanced, the competing colours of a checked shirt are realistically balanced, and neon signs are recreated with the requisite electric glow. Again, a more premium set will deliver more dazzle, but this is otherwise pretty much a flawless performance. Switch to 1080p and the TV’s general character is unchanged, with natural colours and deep blacks again making for a solid and realistic image. The upscaler is very impressive, too, digging up a significant amount of detail and sharpening edges to a degree that makes the image look not a million miles from native 4K. The same can’t be said of any standard-definition content you might occasionally find yourself watching via a beloved DVD or retro TV channel. Clearly, the Samsung is no miracle-worker but, given the amount of processing going on, the image is surprisingly stable, natural and watchable. Every source is delivered with an impressive amount of insight into those deep blacks, and with motion that, while not entirely blur-free, is natural and without judder. Finally, if you’re a gamer you’ll be delighted to discover that the UE40MU6400 has so little input lag in Game Mode (we measured 21.3ms) as to be entirely imperceptible. If you’re playing on this TV and still losing, it’s definitely not the telly’s fault. The MU6400 has three audio modes to choose between, but Standard and Optimised are the only two really worth your time. Standard is, predictably, the one that’s best suited to general viewing, being the most balanced and neutral, while Optimised boosts bass and treble and widens the soundstage, which can be worthwhile with a big action film or game. No processing can completely overcome the limitations of physical speakers, though, and those of the MU6400 are a bit lightweight and sibilant, making most audio sound a bit hard and unsubtle. 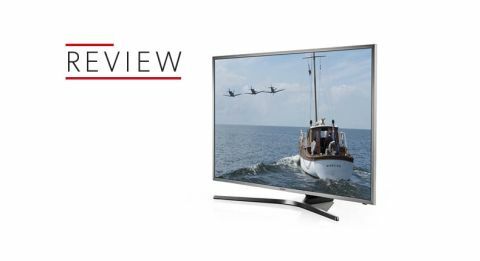 Honestly, there isn’t a TV out there that sounds great, so it’s little surprise that this £500 model is only passable. As always, we’d recommend adding a separate soundbar solution. The Q Acoustics Media 4 (£280) would be a good option. While the UE40MU6400 lacks some of the picture features of its more premium siblings in Samsung’s 2017 range, it does get exactly the same bright and intuitive operating system and the same impressively complete suite of apps. You get Netflix and Amazon Prime Video, Google Play Movies and TV, Now TV, Spotify, and all of the catch-up apps. There are two remotes in the box – a standard, plastic clicker-type, and a more minimalist, stripped-back wand. Neither has shortcut buttons for Netflix or Amazon, which is a shame. Samsung may point to the fact that you can access both using voice commands spoken into a microphone on the top of the wand, but we suspect few people are actually going to do that. Still, the speed and fluidity of the interface makes switching between apps and sources snappy, especially if you initially take the time necessary to re-order them based on what you use most. It doesn’t deliver HDR at its very best, but in practically every other way the MU6400 is absolutely stellar, and for £500 that’s more than a fair deal.